Turns out it was a bottom molar Tuck was working on last week. It finally came through and he calmed down, though I think the top tooth is still bugging him. Still no walking, though I keep thinking it will happen any second. There’s more and more confident standing without support, even standing UP without holding onto anything, but he always sits right back down. 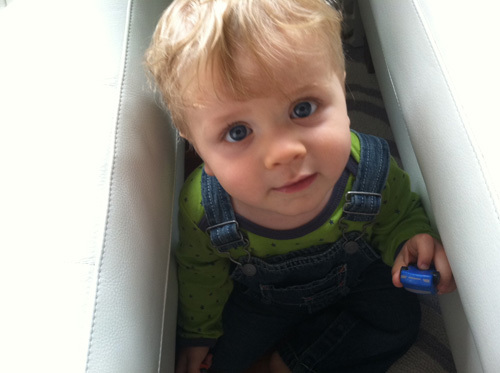 You should see him go with his Ikea push-wagon or the stroller at the park, though: He makes tracks. Have I written about the wagon? The Ikea Ekorre, it’s SO awesome. There are little screws on the front wheels, so you can tighten them to provide more resistance for pre-walkers, then loosen them to roll easily once they’re using it to pull around their toys. 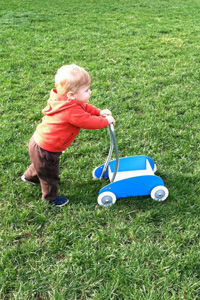 The handle also adjust from straight up (push-toy) to more angled (wagon). All this and not garish, huge or noisy, for $20. As long as I’m talking successful toys, let’s review a few new favorites. Tuck is in a different place play-wise now; he actually pushes cars around on their wheels instead of chewing on them, and he likes playing with puzzles, putting pegs into holes, etc. I’d read reviews of Plan City from Plan Toys on a couple blogs, and we got a first set of little cars from friends for Tuck’s birthday. He fell in love with them about two weeks ago; and I’ve added a few more options--construction vehicles, delivery vans and a school bus. He still likes the “family cars” best, though! The cars are very small (a little over an inch long; they say ages 3+ on them but I feel fine with Tuck using them while supervised), and are made of stained rubberwood with little rubbery wheels. They go fast, which is satisfying, and they’re a nice size for a little hand to hold onto. He usually holds the red car in one hand and the blue car in the other and alternates driving them or placing them in the new bookcase, on the chair, on the floor, etc. (His favorite thing is to play between the chair and ottoman, doing a million reps of some kind of squat exercise: Placing something on the chair, then squatting to put it on the floor, then up to the ottoman, down to the floor, up to the chair, rinse, repeat. Hysterical.) He also puts them through the holes in his shape sorter. When my friend’s 21-month-old was here over the weekend he promptly gathered all the vehicles and played with them the entire time. There’s a whole road-track system, and it goes along with a rail-track train system, if you’re into that sort of thing. I definitely think by the time he’s two we will invest in a couple of the play sets—there’s a gas station, a fire station, etc. All beautifully made and so cute. The prices are steep but the quality is good, from what I’ve seen, and I feel like they’re going to be well-loved all the way up to school-age. The other big hit at the moment is a puzzle train from Melissa and Doug. I got it used at the charity sale last spring, but I only scrubbed it and added it to the toy rotation a few weeks ago. Tuck started out obsessed with the little smokestack—he’d carry it around, and then put it on each peg on the train. Now he also take everything off and puts the various pieces on; he’s especially fond of the little curved roofs and he matches the colors to the blocks underneath them. The only negative is that since we bought it second-hand it was already pretty, um, pre-loved, and the edges have a lot of little chips in the paint. That’s the main thing I prefer about Plan Toys—their stuff seems to be more stained than painted, so the finishes last better. Still, for less than $15 this is a toy with a lot of variety to how it can be played with, and Tuck really loves it. 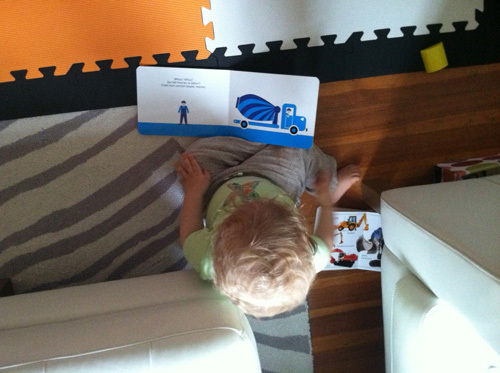 Aside from cars and the puzzle train, Tuck mostly plays with books. He likes removing them from the bookcase and then carrying them around, sitting down to read, presenting them to me, listening to a page or two read out loud, then going and getting another one. He loves the books I bought him in France, which all have really great strong graphics and bright colors. He also consistently pulls down the giant “lap” board books: We have giant versions of the old classic Freight Train by Donald Crews, and a new one, Bats at the Beach by Brian Lies. My very kind editor here at Fit Pregnancy got us that one as part of Tuck’s birthday present and he looooooves it. The poem has a wonderful swing and rhythm, and the paintings are stunning. Tuck flips through it to the page with the snack bar (where the bats are eating moths attracted to the lightbulbs! ), and we like singing the “Going into Hibernation” bat song at the end (to the tune of Battle Hymn of the Republic). There are two other bat books—Bats at the Library and Bats at the Ballgame—but they’re only in regular paper-paged picture book format, which Tuck would destroy. We’ll have to wait; meanwhile we like looking for the baby bat in his little water-floaties on the pages of Bats at the Beach. Don’t forget your moontan lotion! I put out a query on Twitter last week asking if there were any subjects (especially types of products/gear) people would like to see covered here. One friend asked for some research on shoes and socks for this age group: I’m on it. Anything else? Please see below for how to contact me.